Dieser Electronic Fahrregler hat Einknopfbedienung für stufenlose Geschwindigkeitsregelung,	mit Fahrtrichtungsumschaltung über Nullraste, und zwei zusätzliche Funktionstasten für vorbildgerechtes Bremsen und Beschleunigen. Ausbaufähig für Automatikbetrieb. Anschluß an die Gleich- oder Wechselstromklemmen des Transformators 5006, daher auch für einen Außenbetrieb im Garten oder auf der Terrasse geeignet. Modernes Pultgehäuse wie Transformator 5006. Dies ist die erste Version dieses Fahrreglers mit 'ELECTRONIC' Beschriftung, betrieben mit Gleichstrom oder Wechselstrom und geeignet für draht-gebundenen externen Fahrregler wie in der Dokumentation beschrieben. This Electronic Speed Controller with single knob operation for infinitely variable speed control and driving direction reversal, (fixed central off position), also two additional buttons for braking and accelerating. Can be extended for automatic operation. Suitable for operating in the garden or on the balcony and should be connected to either the DC or AC connectors of the transformer 5006. Modern housing as transformer 5006. 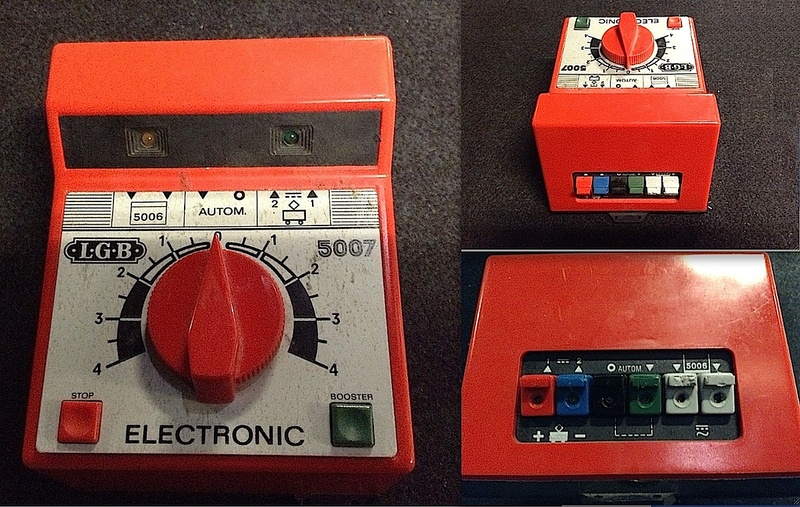 This is the first version of this throttle with the 'ELECTRONIC' designation on the face plate, suitable with either AC or DC power and compatible with a cable based remote throttle as described in the documentation.